For the fourth time in six days, Ole Miss and Auburn squared off on the diamond, this time in a win-or-go-home match-up in the first round of the 2017 SEC Baseball Tournament. 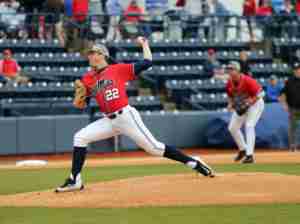 Though they dropped the series, 2-1, at Auburn last weekend, the Rebels had some momentum going into Tuesday’s game, having beaten the Tigers, 8-4, in the series finale last Saturday. Ole Miss entered the conference tournament-opener with a record of 32-24 overall and 14-16 in SEC play. The Tigers began the tournament with depth at pitching, as Keegan Thompson enjoyed a smooth outing (last Thursday), while Casey Mize was fresh after having missed his start last weekend. Nevertheless, Ole Miss jumped out to an early 2-0 lead, scoring one run in the first and one in the second. Nick Fortes’ one-out double to left field scored junior right fielder Will Golsan in the opening inning. In the second, shortstop Kyle Watson singled to left field and plated freshman catcher Cooper Johnson who had notched a two-out double. Rebels’ freshman shortstop Grae Kessinger suffered a season-ending foot injury earlier in the day Tuesday, and the versatile Watson stepped in to fill the spot in the infield. Head coach Mike Bianco indicated he believes surgery is on the horizon for Kessinger, meaning the talented Oxford native will be out for approximately eight weeks and will miss summer ball. Ole Miss pitching: Intermittent rain throughout the game made the playing surface inconsistent at times and factored into three errors committed by the Rebels. While the errors did not lead to Auburn runs, they did cause starter Brady Feigl to face additional batters in tight situations. Feigl pitched out of a significant jam in the second; with one out and the bases loaded, he induced two ground balls to get out of the inning with no runs scored. In the fourth, Auburn led off with an infield single, but Feigl responded by recording a strikeout and forcing a ground out. Auburn answered, however, notching back-to-back, two-out hits. Houston Roth took the mound in the fourth, inheriting runners on second and third base. The freshman gave up a two-RBI triple to Auburn’s Jonah Todd, and Auburn took a 3-2 lead they would not relinquish. Roth pitched 1 ⅓ innings, allowing only the lone hit. Ole Miss tied the game in the top of the six inning vs. Auburn in the SEC tournament-opener for both teams. In the sixth inning, the Rebels and Tigers traded runs. Golsan, who doubled to lead off the inning for Ole Miss, scored on a throwing error by Auburn on a sacrifice bunt from Nick Fortes, tying the game at 3. The Tigers answered, however, in the bottom of the inning, and after six complete Auburn led the Rebels, 4-3. In the seventh and eighth innings, Mize (7-2), who earned the win for Auburn, sat the Rebels down in order. The Tigers then manufactured an insurance run in the bottom of the eighth to take a 5-3 lead over Ole Miss. In the ninth inning, sophomore Ryan Olenek deposited a 1-2 pitch over the left field wall at the Hoover Met for a solo home run, his third long-ball of the season. The Rebels did not manage any other baserunners in the ninth, ultimately falling to Auburn by a final score of 5-4. Bianco commented he thought the story of the game was Ole Miss’ inability to hold the Tigers down both when the Rebels had the lead and when they later tied the Tigers in the sixth inning. What’s Next for Ole Miss? NCAA Selection Show: The Rebels await the NCAA Baseball Tournament Selection Show on Monday, May 29. It will be broadcast on ESPNU with an air time of 11:00 a.m. central. Bianco believes his Rebels have done enough to receive an at-large bid into tournament. “When you look at the resume…5-5 in our league on weekends, we beat Vandy who’s supposedly in; we beat A&M who’s supposedly in; we beat Arkansas, on the road, who is supposedly in,” he said. “We have had some good weekends, and our weekend losses are all against people who are up for National Seeds. We lost to LSU on the road, two out of three. We lost to Florida on the road. We lost to Kentucky on the road, two out of three, and we lost to Auburn on the road, two out of three,” he explained. 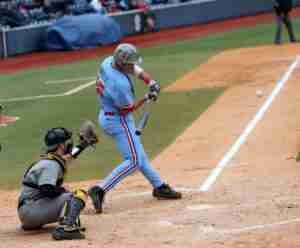 Colby Bortles, shown here vs. Missouri, earned Second Team All-SEC honors. Senior Colby Bortles and freshman pitcher Ryan Rolison received All-SEC honors Monday. Bortles was voted second team All-SEC third baseman, while Rolison was named to the All-SEC Freshman Team. In Bortles’ senior campaign, he has played in 55 of the Rebels’ 57 games thus far. The co-captain has hit a team-high 10 home runs, recorded 42 runs batted in (also a team high), and notched a .482 slugging percentage. When the season does come to an end, Colby will be missed—not just for his play on the field, but for his leadership on and off the field. Rolison, shown here vs. Missouri, was named to the Freshman All-SEC Team. Rolison made 19 appearances (tied for second most on the team with Will Ethridge) for the Rebels and started 10 games–including eight conference starts. The talented freshman entered the weekend starting rotation in game three of the State series, back on April 1. For the season, the southpaw has recorded a 6-3 record and pitched 61 ⅔ innings with an earned run average of 3.06, which leads the weekend starters. Rolison has dealt 64 strikeouts while giving up 57 hits and only 24 walks. Following a six-inning, one-hit shutout against Missouri in which he had a career-high nine strikeouts, Rolison was named SEC Freshman of the Week. Without a doubt, his will be an arm the Rebels depend on for years to come.